Yesterday evening, I went to the Ganpati Visarjan Procession in Pune. This was after a long gap of over 20 years. As expected, quite a few things have changed; and yet some things remain the same. In this brief post, I will list some of my observations and briefly discuss the Ganpati festival history in Pune. The Ganpati Visarjan Procession is Pune’s biggest festival for over 100 years. Historically, the Ganpati festival that starts on Ganesh Chaturthi and ends on Anant Chaturdashi, had been a private celebration. ‘Puja’ was done at the home. Ganpati festival was celebrated with a lot of pomp by Peshwes in Shaniwar Wada. They accorded it much prominence during their reign. This prominence was lost post 1817, after the defeat of the Maratha Empire by the British. Lokmanya Tilak saw an opportunity to use the Ganpati Festival for social and political change in British ruled India, and took the initiative to popularize public festivities in Pune. Few other notable people were also involved, along with Lokmanya Tilak to get the public Ganpati Festival (Ganeshotsav) started. These include Nanasaheb Khasgiwale, Shri Ghotawdekar and Shri Bhau Rangari. (these three are credited with starting the first three Ganpati Mandals(groups) in Pune). Bhau Rangari Mandal is the oldest Ganpati Mandal today, celebrating the Ganpati Festival since 1892. Today, this Ganpati Mandal Procession precedes that of the two most famous Pune Ganpati Mandals – Dagdusheth Halwai and Mandai. In addition to these three, the first five Ganpati Mandals in the Procession are also allotted a special (“Manache”) status and are called as “Manache Ganpati”. 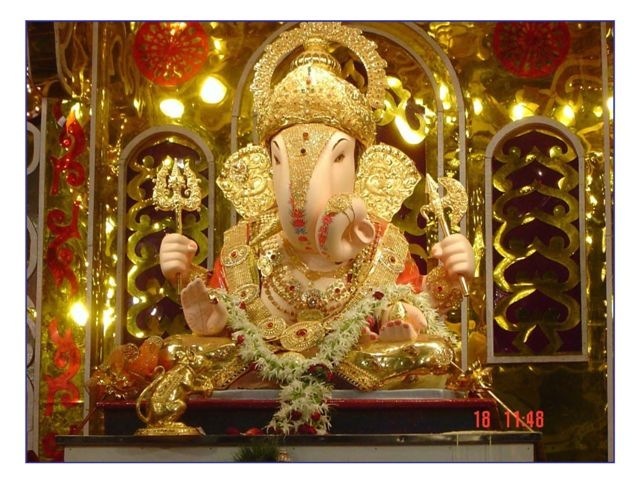 These are: Kasba Ganpati, Tambdi Jogeshwari, Guruji Talim, Tulshibag and Kesri Wada. Lighting and displays – Technology and lighting have come a long way in the past two-three decades. Hence it was not surprising to notice major changes in the decorating lighting and displays on the procession trucks. I am sure the decoration budgets have also increased substantially. All the Ganpati processions were illuminated with very bright flood lights – like the ones you would see in studios and sporting arenas. Also noticed lasers being used for special effects by one Ganpati Mandal. Each Ganpati Procession Truck convoy had a truck with a big power generator to power all the lighting. Gone are the days of the Gas-Lamps, which were a common sight in the 1970s. Live coverage on TV – Many local channels now carry a live broadcast of the procession, with cameras at various points along the route. This is very convenient for those who want to see the procession festivities without getting near the crowds… having said that, technology still has a long way to go to create that real excitement and experience. Multiple routes – Over the past few years, with the increase in the number of Ganpati Mandals and the crowds, multiple procession routes are used. Some of them still converge near Lakdi Pul for the Visarjan. Better organization – In spite of the big increase in crowds and Ganpati Mandals, I thought the procession (especially the crowd management) was better than that from the 1980s. Food stalls and other support services (first-aid, police helpdesks, etc.) were located at regular intervals along the route. Gulal – Probably the biggest change I noticed from two decades back to present was the marked reduction (virtual absence in many Mandals…) of ‘Gulal’. This pink-red colored powder was the signature of any Ganpati Procession for years, but concerns about pollution and toxicity have put a welcome curb on its use. Music – Bollywood and other pop music continues to be prominent during the procession. (I expected to hear the latest Bollywood hit, but was still a bit surprised when one Mandal was playing ‘Waka Waka’!). Still, I got the impression that ‘Dhol-Tasha’ (traditional Indian drums) are regaining some importance back. Many Mandals had pure traditional music and Dhol-Tasha drums. This is another welcome change. We have enough venues where pop music is played… keeping it out of Ganpati Procession will be a great trend! Sumitra Elephant – Sumitra Hatti (Elephant) from Peshwe Park was a star feature of Ganpati Visarjan for many years, leading the first ‘Manacha’ Kasba Ganpati Procession. Unfortunately the elephant died a few years back and since then this tradition was broken. A few Ganpati Mandals have created the elephant’s replicas as part of the procession displays. The sea of humanity – The Ganpati Visarjan Procession has always represented a huge gathering of people. That hasn’t changed one bit. In fact, as the population and the number of Mandals have increased, the crowd has gone up if anything. Crowd excitement – The crowd excitement, enthusiasm and participation is still amazing. This is what makes the Ganpati Visarjan Procession a great event! Many regulars are lined up along the routes, occupying strategic spots by the road side or in the houses/offices along the way. They stay there for hours..all the way through early morning. ‘Ganpati Bappa Morya’ is heard everywhere. Multi-cultural event – The Ganpati Festival continues to be a big multi-cultural event with people from various parts of India (and the world) participating in the festivities. The Dhol drumbeats – The signature Dhol-Tasha drum beats are omnipresent. They gives that unique feel and atmosphere to the Ganpati festival in general and the Visarjan Procession is particular! Performances by local schools – Local schools still prominently feature in the processions. Thanks Suhas. Unfortunately, I didn’t carry a camera. Maybe next year! I am sure there are many good videos uploaded on youtube. Noticed quite a few young women dancing in the procession, neatly cordoned off by volunteers – don’t remember seeing either the girls or such volunteers around 15-20 years ago when I used to regularly view the procession. Celebs – don’t remember seeing any earlier, but was surprised to see Ajay-Atul in the ‘rath’ of one of the mandals.